All transactions are safe and secure with a reliable history in online purchasing behind each of our associates. 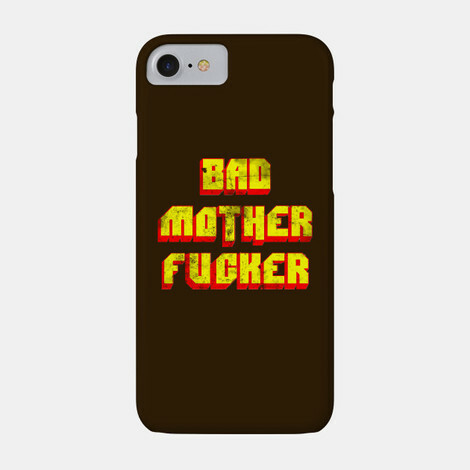 Buy the Pulp Fiction Bad Mother iPhone Case to own Pulp Fiction clothing and merchandise. This Pulp Fiction iPhone case will let everyone know that you're not to be messed with. The design is based on Jules' wallet from the movie. Jules tells Pumpkin to get his wallet out of the bag. When she asks him which one it is, he informs her that it is the one that says Bad Mother******. It is then that she fully realizes that her attempt to rob the patrons of the restaurant was a big mistake. This Bad Mother iPhone case might help to deter criminals from attempting to steal your phone. In addition to the Pulp Fiction Bad Mother iPhone Case above, browse the Pulp Fiction Clothing Gallery for more apparel like men's and women's clothes, kids shirts or hoodies.